Caron Chiropractic Clinic, PA provides an excellent therapeutic massage and a full range of chiropractic medicine to the people of St. Paul, Highland Park, Minneapolis and other communities in Minnesota. Not all chiropractic centers offer therapeutic massage, but the team at Caron Chiropractic Clinic, PA believes that it is an important component of a comprehensive approach to health and healing. Therapeutic massage has been linked to improvements in many different conditions including headaches, anxiety, digestive issues, fibromyalgia, insomnia, soft tissue injuries and sports related injury. In fact, therapeutic massage is being used more frequently for athletes to promote healing and reduce symptoms of overuse. The staff at Caron Chiropractic Clinic, PA can tailor a treatment plan specifically for you — to address any symptoms you have and meet your unique needs. In athletes, therapeutic massage can help increase your range of motion and flexibility, reduce general pain, soreness and stiffness, and increase blood flow. As a result, you may notice an overall faster recovery time after sports injury, increased mental focus and reduction of stress and anxiety. If are interested in pursuing therapeutic massage therapy, our team is uniquely qualified to help you. Regardless of your chiropractic issues, Caron Chiropractic Clinic, PA can help you get back on the road to chiropractic and overall health and wellness. We make it easy to to make an appointment, and will sit down and discuss the issues you are facing. The range of problems that can be ameliorated by chiropractic medicine is broad. In addition to therapeutic massage, our team can also help if you are seeking relief from work-related injuries, car accidents, or other significant physical traumas. With a staff of highly trained practitioners of chiropractic medicine and licensed massage therapists, clients with a wide range of chiropractic issues will feel welcomed and cared for. 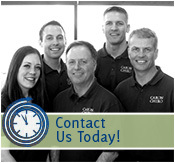 The Caron Chiropractic staff prioritizes the total wellness of their patients, and that will be clear as soon as you enter our clinic. Our staff know their profession and communicate that to you through their therapy. If you need therapeutic massage simply because of the build-up of life stress, or if you are recovering from anything from a minor injury on the playing field to the aftermath of a bad car accident, therapeutic massage can help you immediately. If you would like more information about therapeutic massage and how it might work for you, call the team at Caron Chiropractic Clinic, PA at 651-255-9999 for more information. This entry was posted	on Wednesday, February 8th, 2017 at 4:09 pm	and is filed under Chiropractic, Chiropractor, Massage Therapy. You can follow any responses to this entry through the RSS 2.0 feed. You can leave a response, or trackback from your own site.